Home » Blog » 2018 UPSC Prelims : How IASbaba helped in UPSC Prelims-Answer Key and Explanation – Toughest Prelims in History of UPSC! 2018 UPSC Prelims : How IASbaba helped in UPSC Prelims-Answer Key and Explanation – Toughest Prelims in History of UPSC! In the Annals of UPSC history, June 3 , 2018, would go down as one of the weirdest days. For one, most of you were left at the mercy of dice for more than 20 questions. These are tough days for UPSC aspirants. It is understandable but at the same time, we don’t completely buy the arguments that UPSC has been erratic or unreasonable in its approach. After all, it is an independent Constitutional body and is free to use any means to eliminate maximum aspirants in the very first stage of CSE. We can have passionate discussions about it and even cry for that matter but that won’t help! 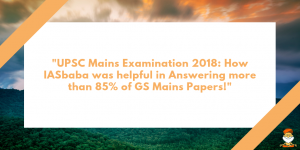 But then we at IASBaba are upbeat that YES in spite of being the toughest paper in UPSC history, the year in which who’s who of coaching were targeted we were still able to make a tangible and substantial difference in your preparation! We are only happy that we helped students prepare better. And this for the fourth successful year, We have done it!! Q) Which one of the following links all the ATMs in India? 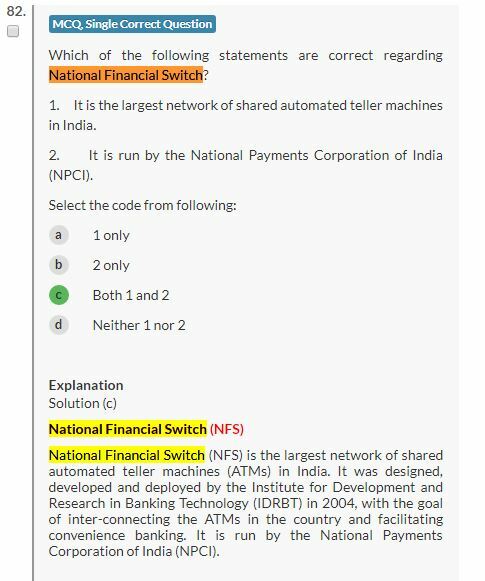 National Financial Switch (NFS) is the largest network of shared automated teller machines (ATMs) in India. It was designed, developed and deployed by the Institute for Development and Research in Banking Technology (IDRBT) in 2004, with the goal of inter-connecting the ATMs in the country and facilitating convenience banking. It is run by the National Payments Corporation of India (NPCI). The civilian nuclear reactors come under IAEA safeguards. The military nuclear installations come under the inspection of IAEA. The country automatically becomes a member of the NSG. Which of the pairs given above are correctly matched? Reference: IASbaba 60 Days Full Mock 1- You could have easily eliminated if solved Q.69 sincerely knowing Kirkuk’s and Mosul’s location. In the PDF, we have tried to give detailed explanation and IASbaba’s references. UPSC is still manageable if you give your 100% while preparing and while attempting the paper. For the first time, UPSC has allowed the candidates to file grievances against the discrepancies/ ambiguities in the Prelims questions between 4th June to 10thJune 2018. You can go through the detailed Key Explanation given by IASbaba and if you still feel there is any anomaly in the questions, you can register your grievance.